Lois W. Kolkhorst knows the value of taking chances and implementing change. As a state representative, she deals with that as she tries to take care of the state's business. On Saturday, Kolkhorst (R-Brenham) sent that message of taking chances and implementing change to the 695 graduates who received degrees during the Sam Houston State University both commencement ceremonies. Kolkhorst said she could recall when she became a college graduate and all the uncertainties she had. "I remember it was the spring of my senior year and I realized I wasn't good enough to be a pro golfer," she said. "But I didn't know what I wanted to do." She challenged the graduates to leap from their comfort zones and create change. "Think of the past four years of your life. You have been comfortable in your surroundings and had a small place that you called home, whether it be a dormitory, an apartment or someplace else," she said. "Now, it all changes." 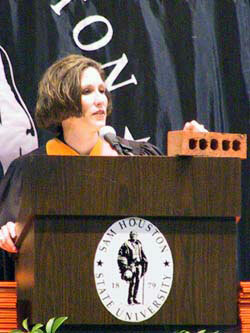 Kolkhorst placed a brick on the speaker's podium during her commencement speech and explained that someone must take a step to remove it. "It takes someone behind every action. Be a doer. Don't go through life saying 'Someone else will do it,'" she said. In conclusion, Kolkhorst challenged the graduates to set goals and to not be afraid to take risks. "... do one small thing that makes this world a better place to live in. Be the example," she said. SHSU president James Gaertner also congratulated the graduates and noted that about 250 of Saturday's students were first-generation college graduates. "You have worked very hard to reach this milestone," he said. "Thank you for choosing Sam Houston State University." A native of Brenham, Kolkhorst is the budget and oversight liaison for the House Committee on Business and Industry Committee, and is a member of the House Appropriations Committee, the Local and Consent Calendars Committee and the House Select Committee on Ethics. She is also the vice-chair of the House Rural Caucus and the vice-chair of the House Caucus on Tourism. Kolkhorst was named to the House Select Committee on Higher Education this year, where she works to create changes to improve colleges and universities. Earlier this year, Gov. Rick Perry named her to the Clean Coal Technology Council, which advises Perry on the feasibility of new technologies for coal-burning energy in Texas. Since her election in November 2000, she has been named to the Commerce and Economic Development Task Force of the American Legislative Exchange Council and served as chair of the House Subcommittee on Water Safety. She has also served as a member of the Texas Research and Oversight Council on Worker's Compensation, which focuses on statewide worker's compensation issues. During her freshman session, Kolkhorst authored and passed seven bills, five of which had a statewide impact. The list of bills she has authored and sponsored have tackled issues such as criminal justice and prison reforms, education funding, agriculture policies, consumer rights issues, economic development and community housing issues and domestic violence legislation.